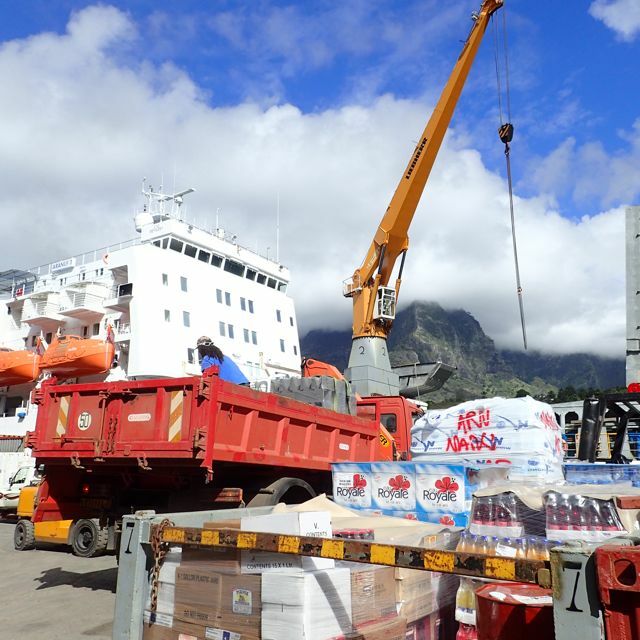 Ara Nui in Hiva Oa, Marquesas, hard at work unloading freight. 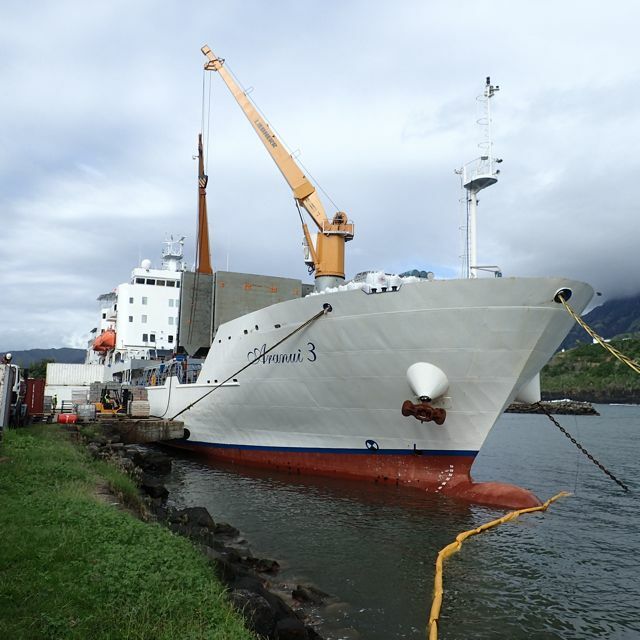 How do imports and exports transit in the remote Marquesas? “Lifeline to the Marquesas” the Ara Nui makes 16 2-week trips a year through French Polynesia, most of it in the Marquesas…. It’s a freighter. It’s a passenger liner. It’s both! off for more efficient transport. 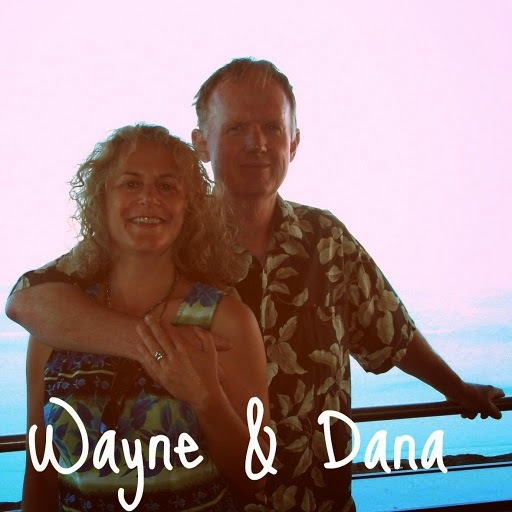 We first encountered the Ara Nui 3 in Hiva Oa, Marquesas., not long after our arrival. 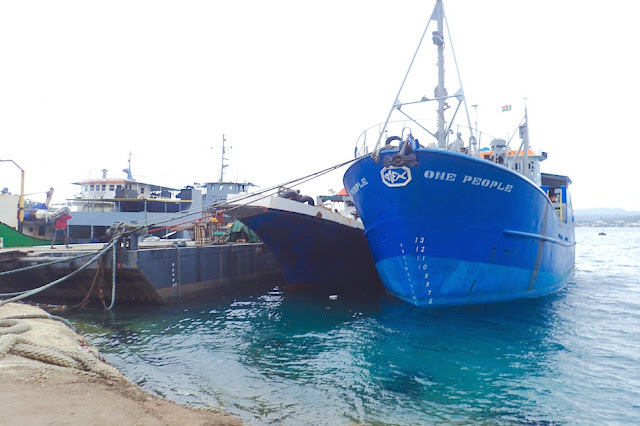 At oh-dark-hundred, about 2 am, she managed to wedge herself into Hiva Oa’s small Tahauku Bay anchorage (S9.48.260 W139.01.924). 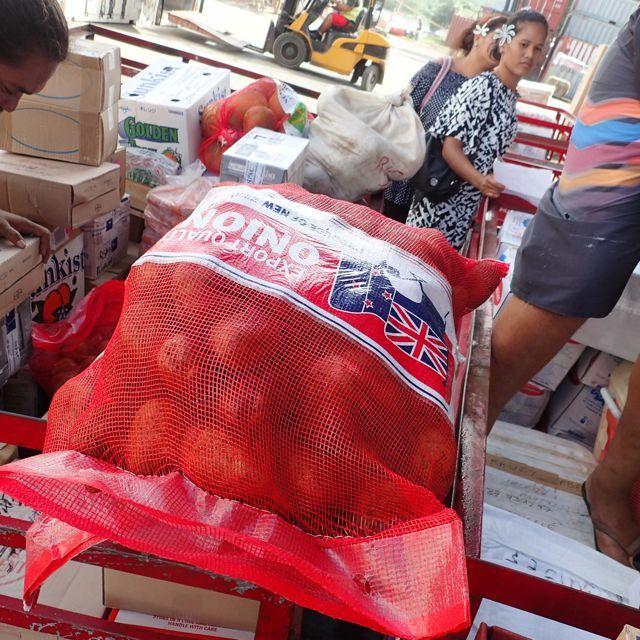 When we awoke it seemed over half the island population’s individuals and business workers turned out to pick something up. There was a substantial lineup of trucks. There were forklifts going nonstop. There was a crane offloading boxcars of cargo. 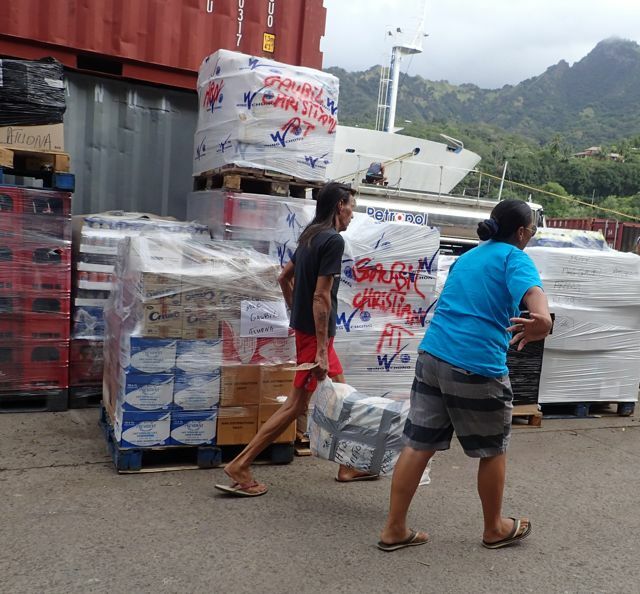 Hustle and bustle of freight unloading on the Ara Nui in Hiva Oa. Despite Hiva Oa’s seemingly ideal agricultural conditions, the majority of their produce is imported via the Ara Nui… onions, potatoes and ironically, even pamplemousse comes in, with New Zealand serving the Marquesas as their primary bread basket. The Kubota tractor import was a veritable magnet for male lust, as she was gazed upon from admiring eyes, and even stroked, wistfully. 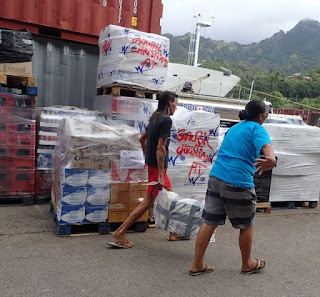 Hiva Oa’s exports are primarily copra (coconut flesh) and construction gravel. As the Ara Nui passengers ambled off, they flocked to take photos of “The Copra Guy,” as did I. By mid afternoon, the Ara Nui was done with all it’s imports and exports, and we watched the fascinating process of her exiting tight and tiny Tahauku Bay (watch for photos in a later post). 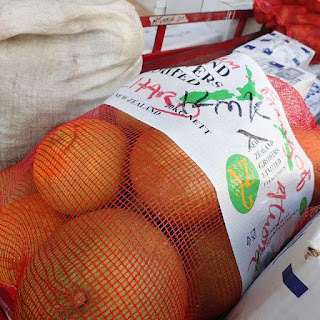 Like the locals, we flocked to the stores to check out their freshly restocked shelves – the next day many stores would be closed for one of May’s 4 3-day holiday weekends. 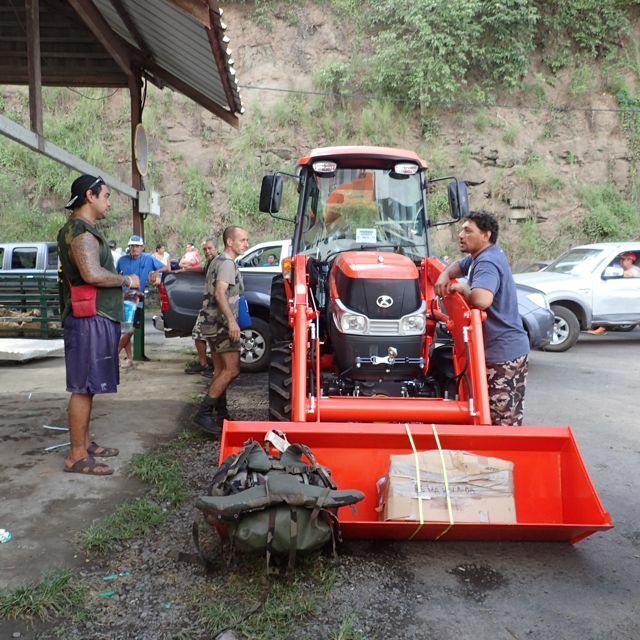 from the local Marquesas men than this Kubota tractor. 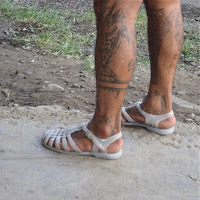 Like the tides, the Ara Nui is an integral part of the fabric of life in the Marquesas. We’re glad we got a glimpse. 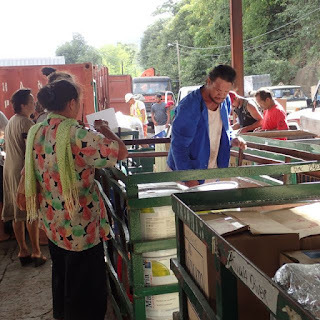 Ara Nui freight import paperwork processing. More New Zealand produce on its way to Hiva Oa from the Ara Nui. 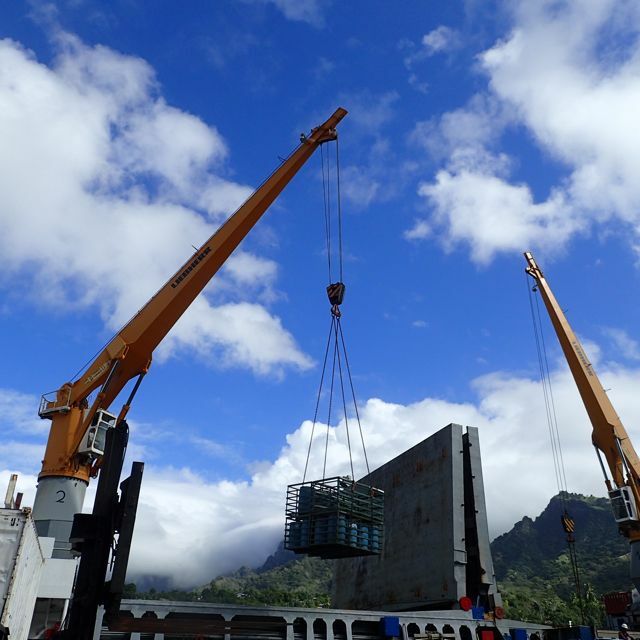 Ara Nui crane lowering a crate. 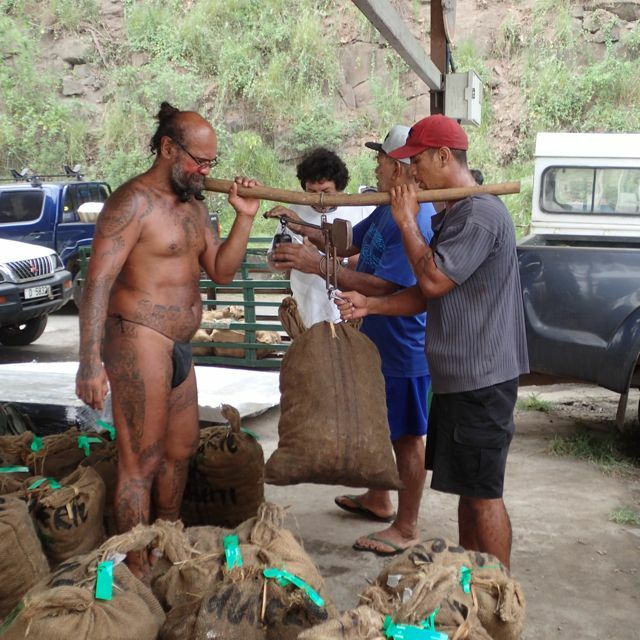 Weighing copra for the Ara Nui to export in Hiva Oa. Yes, that’s just a loincloth he’s wearing…. 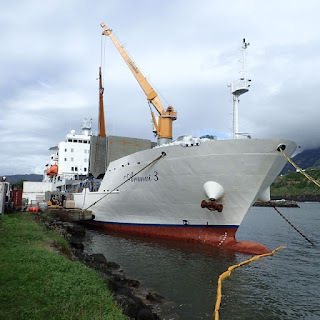 We’re currently anchored in Taiohae Bay, on Nuka Hiva, Marquesas, French Polynesia (S8.54.856 W140.05.880) though the photos for this post and our first Ara Nui encounter was in Tahauku Bay, Hiva Oa (S9.48.260 W139.01.924). I toured the Ara Nui there; watch for that in a future post, as well as one showing how the Ara Nui wedged its way out of Tahauku Bay. kind of spoiled the look, in my opinion. Only you could find a fashion faux pas in Marquesas after riding the high seas. Nicely written piece. The box cranes reminded me of my engineering career in designing & testing. Oh yes, I would like the Kubota, too?